A new Halloween tradition has kids of all ages turning tricks into treats for their neighbors -- the Halloween Boo! Similar to the Christmas tradition of being socked, you leave a small treat on the doorstep of a neighbor or friend when they are gone, along with a sign letting them know they've been booed; each neighbor passes on the fun to another friend! Leave the sign up so everyone knows you've already participated. Follow these basic instructions for booing the people in your neighborhood. Decide how many neighbors you want to boo -- one, two, or even 10! Pick up a bag, bucket, or other container for each person, plus treats and goodies, and put the bags together. Print out a Halloween Boo sign using Adobe and include it in the bag with the instructions for the neighbor to pass the surprise along to others. Use one of the two below. Wait until you know your neighbor is out and then quickly deliver the boo bag to his or her front step! If you know the person you're booing well you can tailor it to his or her favorite activities. For example, someone who enjoys gardening might like to get a small fall mum, trowel, spade, the movie Little Shop of Horrors, and Halloween-themed gardening gloves. Pick out a Halloween-decorated bag and tie multi-colored ribbons on it, curling them to make a festive presentation. Hollow out a large pumpkin. Line it with plastic and then fill with all the goodies. Use a plain brown paper bag and tie it with raffia and fall plaid ribbons. Attach a large plastic sunflower to the front for a fall-themed take on the boo bag. Package the bag to fit the sub-theme of the goodies inside -- for a gardening theme, use a terra cotta vase. If kids are helping out, let them color pictures, add stickers, and write fun Halloween jokes on the outside of a plain white bag. While a basic boo bag might be filled mostly with candy and trinkets, you can certainly take it up a notch. Give the typical treats a spin! 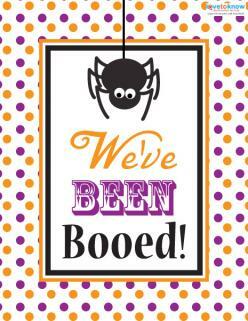 Instead of booing your neighbors, "boo-ze" them by giving them an alcoholic treat or two! Pick out a bottle of wine or liquor and a couple of glasses to put into a small box. Be sure you leave it at a time when you can keep an eye on it, so those under 21 who may have seen your delivery don't spirit away the drinks. 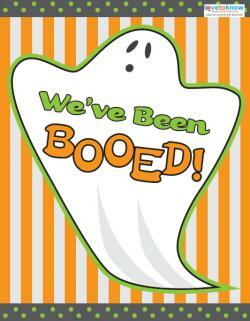 Similar to booing, getting ghosted is when treats are left for neighbors as if they appeared out of thin air -- just like a ghost! 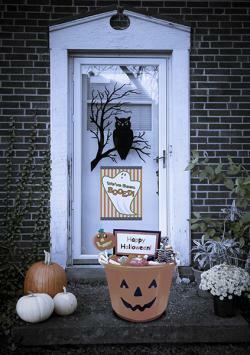 Play up the ghost theme buy choosing white bags or buckets covered in white gauze or tulle, and look for ghost-shaped candies and cookies, along with other white treats and trinkets. If the person you want to give a boo to has furry friends, consider making him a pet-rifying present. For example, a Halloween bandana for a dog or new collar for a cat is the perfect start -- add a few Halloween chew toys and some treats, and you're finished! Package it in a water dish and wrap in Halloween-themed cellophane, tied with a large black and orange bow. Halloween doesn't have to be a scary holiday, and it's not limited to trick-or-treating for kids. Get the whole family in on the fun by booing a few neighbors!